The end of the year is good for a review of 2014 but also for a preview of 2015. 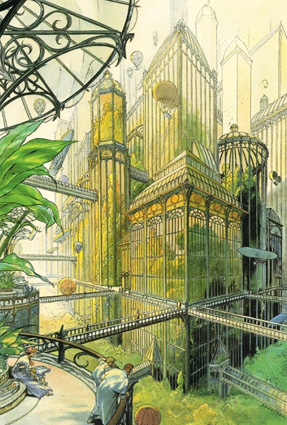 What are the plans of François Schuiten and Benoît Peeters for the new year? Two exhibitions that started in 2014 will end. First the exhibition in Lyon. Anne-marie and Roland Pallade presented in their Galerie d'art contemporain in Lyon an exhibition with combined work by Luc and François Schuiten. The exhibition ends 24/01/2015. The Revoir Paris exhibition in Paris runs until March 9, 2015. This exhibition at the Cité de l’Architecture celebrates the publication of the latest album Revoir Paris. The exhibition provides an opportunity to dream of a future for Paris, far beyond technical, political and economic constraints. Lumières sur les Cités will be the next big exhibition about the work of François Schuiten and Benoît Peeters. This exhibition can be visited from October 6, 2015 in Mons 2). In Lumières sur les Cités, the visitors will be submerged into a universe of spectral images, appearing and disappearing again under shadow and light effects. These images will only be revealed if the visitors closely examine them; in this case, mysterious phenomena or unexplored passages will appear. This exhibition combines original and multiple engravings (serigraphs, lithographs, posters) honoring the donation to the museum. On this occasion, François Schuiten will create a new edition related to disappeared or still existing emblematic sites in La Louvière. As a kind of ‘past in the future’, this ‘trip’ refers to the history of our cities while making us look forward to the future. L'Auberge du Cheval Blanc is an Operetta in three acts. Music by Ralph Benatzky. Libretto by Erik Charell, Hans Müller and Robert Gilbert. In 2012 François Schuiten made the scenography for this operetta. The operatta will be performed again in Charleroi on 14 and 15 February 2015. 3). 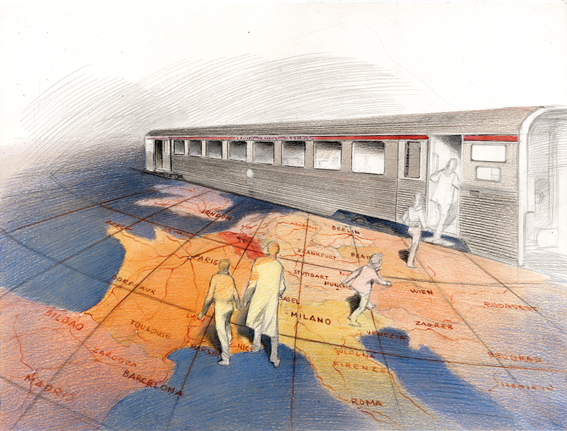 Trainworld in Brussels with the designs of François Schuiten will open in September. Schreiber und Leser plans to publish another German translation “Die mauern von Samaris” 4). Also Fibra plans another two Croatian translations for 2015 or 2016 5). The Chinese publisher People Fine Arts will start publishing the Obscure Cities series. The first two volumes that are expected to be translated are: La Tour and L'Enfant Penchée. Alaxis Press expects to publish two English translations in 2015. First “Mary, The Little Leaning Girl”, followed by “The Theory of the Grain of Sand”. And at the end of 2015 it will be 20 years since Eilko Bronsema and Caspar de Wind started working on the first internet pages that would become EBBS.net, that was converted by Joseph le Perdriel into altaplana.be in 2011. It looks like it will be again an exciting year! This blog post was created on 2014-12-25 at 16:01 and last modified on 2018-02-17 at 17:21 by Joseph Le Perdriel.